Sand about 3cm of one end of the magnet wire, and sand about 3cm of the other end of the wire along one side only. Wrap the wire around the tube to make a coil, leaving straight (sanded) ends uncoiled. Slip the coil off the tube and wrap the ends around the coil to keep the coil wound. Balance the coil between fingers, and spin it. If it wobbles when it spins, adjust to make it spin evenly. This is going to be the coil of our motor. When we put electricity through it, it will become a magnet. 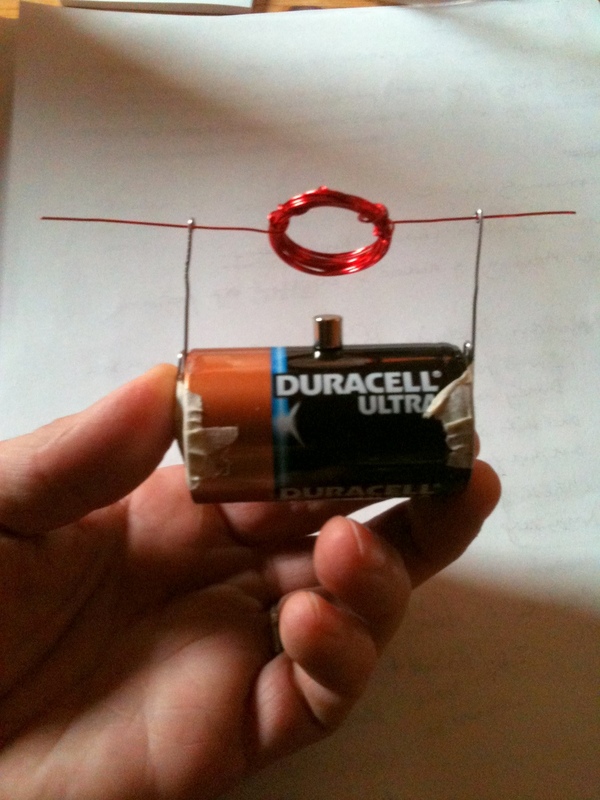 Tape paper clips to each terminal of the battery. Slide the coil into the exposed loops of the paper clips. Bring magnet close to the coil. It may start spinning on its own, or it may need a little flick to get it going - it might want to turn in either direction. Try holding the magnet under or beside the coil to find the best spot to keep it spinning. If the magnet is small enough, it can alternatively be stuck onto the magnet. 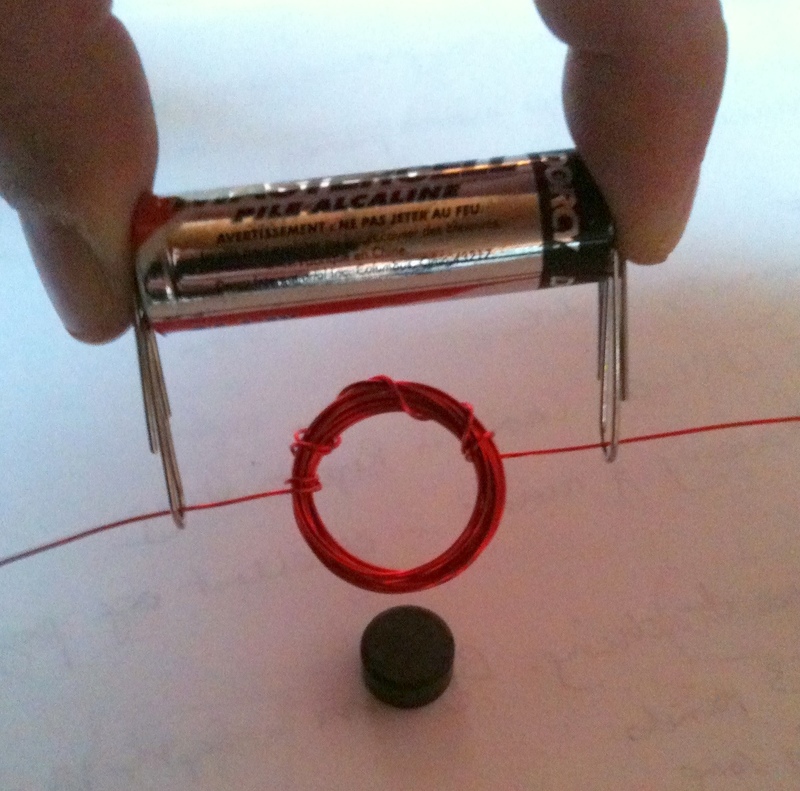 When electricity from the battery goes through the coil, it turns it into a magnet. The coil magnet is pushed or pulled by the permanent magnet held near to it, making the coil turn. This is a basic motor! When electricity flows through a wire, it makes a magnetic field around it i.e. turns it into a tiny magnet. When the wire is coiled, the smaller magnetic fields of each wire combine to make a larger field i.e. one larger magnet (the wire must be insulated so that the electricity must to around and around the coil, not jump between wires). The coil is only sanded on one half of the wire on one side so that current only flow half the time, so the coil is only magnetic half the time. If the coil was magnetic all the time (by fully removing the insulation on both sides) it would be alternately attracted and repelled by the permanent magnet, so the coil would just oscillate, not spin.